Helps support healthy skin, a shiny coat, and a new attitude. GO! SKIN + COAT CARE™ Salmon Meal Mixer by Petcurean is made with premium-quality salmon, and includes salmon skin, a great source of EPA + DHA Omega-3 fatty acids which help maintain healthy skin and a shiny coat. 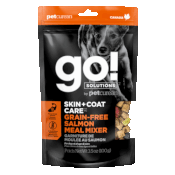 Mix it into your pet’s favourite Petcurean kibble, stew or pâté, or serve it up as a tasty snack that adds a boost of concentrated nutrition.